Soon, the farmer got to the market with the goose. There, he saw a man with a hen. “I’ll give you my goose for your hen,” he said to the man. ー Hans Christian Andersen, Emperor’s New Clothes , Compass Publishing, 2009, p.6. “But then, I gave a man the hen for a sack of rotten apples,” the farmer said. The farmer’s wife put her arms around her husband and kissed him. “Now, I can give her some rotten apples,” she said. 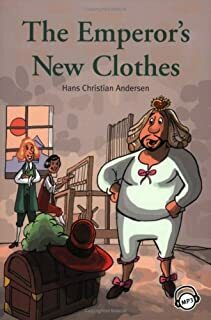 ー Hans Christian Andersen, Emperor’s New Clothes , Compass Publishing, 2009, pp.9-10. ー Hans Christian Andersen, Emperor’s New Clothes , Compass Publishing, 2009, p.19. The little mermaid went into the prince’s room. He and the princess were sleeping. She could not kill him. She loved him too much. She threw the knife into the sea. “I will do it,” said the little mermaid. “He will marry me. I know it,” she thought. ー Hans Christian Andersen, Emperor’s New Clothes , Compass Publishing, 2009, p.16. The woman paid the witch and took the seed home. She planted it. It grew into a flower. The woman kissed the closed flower petals, and the flower popped open! A tiny girl was inside. She was as big as thumb. The woman called her Thumbelina. Thumbelina was very pretty. She had a sweet voice. She slept in a walnut shell. Her mattress was made from flower petals. ー Hans Christian Andersen, Emperor’s New Clothes , Compass Publishing, 2009, p.22. “You’re right,” the mouse said. ー Hans Christian Andersen, Emperor’s New Clothes , Compass Publishing, 2009, p.32. ー Hans Christian Andersen, Emperor’s New Clothes , Compass Publishing, 2009, p.33. ー Hans Christian Andersen, Emperor’s New Clothes , Compass Publishing, 2009, p.35.